350.org has been leading a nationwide movement among colleges and universities to divest from fossil fuel companies, a method of activism modeled after the successful 1980s divestment campaign against apartheid South Africa. The current movement, "going fossil free," has by any reasonable measure taken off, as chapters of 350.org have forced the divestment issue into the board rooms of university trustees across the country. How have university boards responded? Many with predictable (and not necessarily unwise) hesitation. University endowments have an ethical integrity to them almost by definition—the world does a lot of terrible things with its money, but using capital to protect the future of educational institutions is not one of them. Naturally, the caretakers of such holdings get skittish when the idea of divesting the endowment arises. The broader point, though, is that what the university does with all that money matters, or at least it ought to. With that ethic in mind, some schools have already taken steps to divest. Others have resisted even having the conversation. For most, however, the reaction has been somewhere in between, usually the establishing of committees to explore the idea and feasibility of divestment. 1. Does the country, sector or company engage in activities that are universally held to be gravely injurious to society? 2. Is there a clear and definable standard by which countries, sectors or companies are included or excluded from the divestment decision? 3. Is divestment the best way to effect change, and is it clearly superior to attempts to engage constructively as shareholders with the companies or governments in question? 4. What are the broader economic consequences of divesting from these entities? In particular, do these entities provide value to society as well as costs? I tend to endorse questions that may appear relatively straightforward but lead to complex answers, and I think this set of questions does exactly that. As a point of departure, they seem useful. Still, I'm not convinced these questions will offer clarity at the point of decision. For that, I think it's worthwhile to explore an historical parallel to the contemporary divestment campaign, the movement to abolish slavery in the western world in the late 18th and 19th centuries. By demanding divestment, we are similar to the 19th century abolitionists. They also lived in an economic and social milieu defined by the evil of slavery in their midst. The Northern mills prospered upon cheap southern cotton. Yet the abolitionists did not call for boycotts of manufactured clothing. They demanded an end to slavery on moral grounds. True enough... the anti-slavery crusade in Great Britain could arguably be considered the greatest triumph of moral politics over political economy in the history of the West. 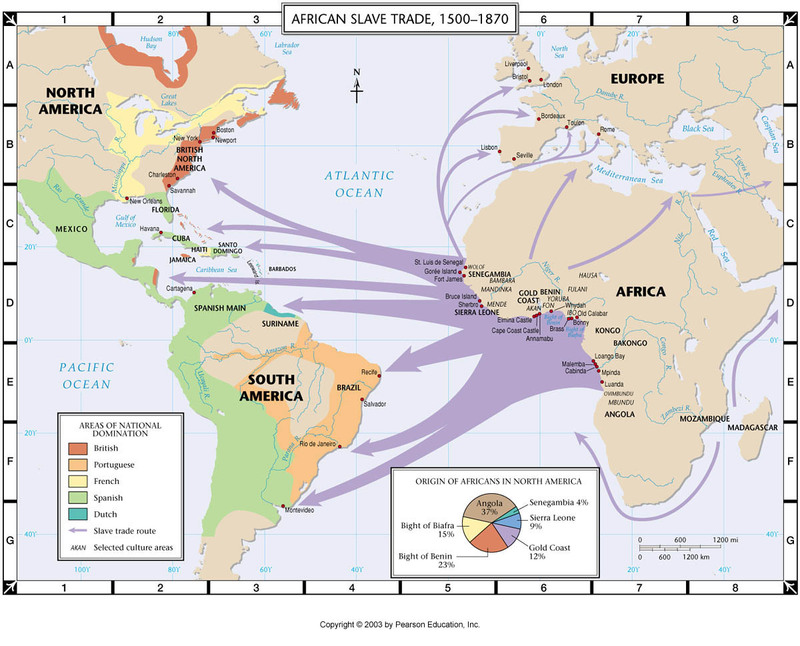 And, much like our current fossil-fuel economy, the slave trade in the 18th century Atlantic World was everywhere. 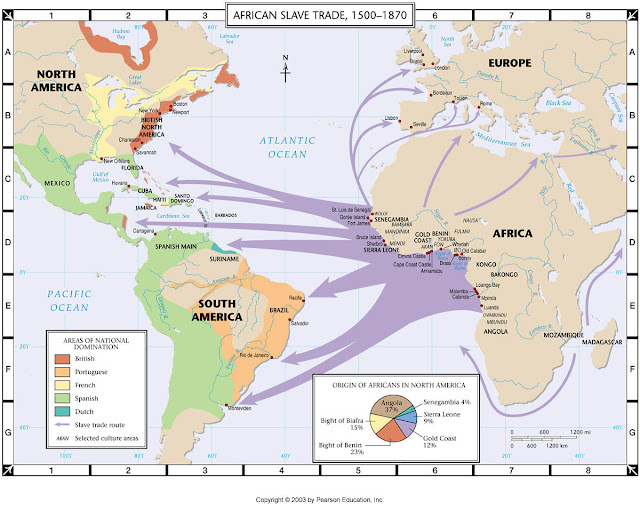 This map of the Atlantic slave trade looks familiar to most students of history, but the geographic ubiquity of slavery sometimes overshadows its economic pervasiveness. Capitalism and slavery, as Eric Williams argued, developed in tandem with the profits of slavery propelling the Industrial Revolution. We associate slavery with cash crops and plantation agriculture: sugar, coffee, indigo, rice, and cotton, but slavery's tendrils reached every part of the Atlantic World economy. Slaves worked mid-Atlantic farms and were fed by cod from New England fisheries. Abolitionists faced a problem of scope similar to that fossil fuel protesters face today: how to assault an institution or a commodity (or both) that is the foundation of the entire economy? A moral stance, employed in both reform cases, becomes vulnerable to pragmatic economic criticisms. Question 4 mounts exactly this challenge: "do these entities provide value to society as well as costs"? The history of slavery, however, exposes the absurdity of this question. Did slavery provide social benefits? Of course it did. The economy was built on slavery, so all the social benefits from the wealth derived from Atlantic World commodities were indebted, at least in part, to the slave trade. Rhode Island slave money (and a few slaves themselves) helped build Brown University. Should the economic reality of the Atlantic World have dissuaded abolitionists from taking up their cause? Fossil fuels provide all kinds of benefits to our society, not least our ability to drive here and there and to heat our homes. But the cost is extraordinary: the destruction of our biosphere that will endanger global food security and therefore human civilization. The better question would ask not whether society benefits—when society does not benefit from something, reform is often pretty easy—but whether the benefits can ever justify the costs. From our vantage point in the 21st century, the answer to the case of the 18th century is obvious: the enslaving of millions of Africans was an atrocity. What, then, should we expect from a 22nd or 23rd century historian reconsidering the environmental movement of our time? Between 1787 and 1792 popular antislavery clubs were established and a mass campaign of petitions to Parliament was organized. This led first to amelioration laws specifying conditions for carrying slaves. In 1788 Parliament passed the Dolben's Act, which established for England the first limits on the manner of carrying slaves aboard English slavers. This act in turn was further modified in 1799 giving greater space for each slave on the vessels. But this was only the beginning. After several failed attempts at passing a definitive prohibition of the trade, the abolitionists in Parliament, under the leadership of William Wilberforce, moved toward partial restrictions by closing down parts of the trade.... Finally, in March 1807 came the definitive abolition of the British slave trade itself, which was forced to end by the first day of 1808. In the House of Commons, the vote on the 1807 bill was 283-16. Seymour Drescher in his magisterial history Abolition: A History of Slavery and Antislavery, writes of the abolitionist triumph that, "The overwhelmed opponents of abolition were quite sure about what had created the abolitionists' unprecedented margin of victory. General Gascoyne of Liverpool, representing Britain's major slaving port, complained that every measure that invention or art could devise to create a popular clamor had been brought to bear:"
The Church, the theatre, the press, had laboured to create a prejudice against the slave trade.... The attempts to make a popular clamor against the trade were never so conspicuous as during the last election, when the public newspapers teemed with abuse of the trade, and when promises were required from different candidates that they would oppose its continuance. There has never been any question agitated since that of Parliamentary reform, in which so much industry had been exerted to raise a popular clamor and to make the trade an object of universal detestation. If the green movement follows a path to a low-carbon future modeled after the quest to end the slave trade, it would follow suit that 350.org and the divestment campaign ought to be an important part of it. To complain that divestment might not be the most effective method for reform is to ignore the reality that, at this point, we need to fight for the climate with every method possible. Students are not unaware of the urgency, which is why it is so heartening to see them take up the fight and make real progress on some of the oldest and richest campuses in the nation. Divestment has not escaped the notice of the champions of unfettered capitalism either. The National Review's Stanley Kurtz recently wrote a three-part story on 350.org in which he lamented that divestment was a tragic marker of America's youth losing faith in capitalism. Energy is so fundamental — in a sense, fossil fuels are the economy — that our climate wars increasingly serve as proxies for a battle over the status and even the existence of America’s free-market system. It seems strange to me that the right can accuse the left of "global warming alarmism" so often (despite the fact that climate concerns are based on science), then cry the sky is falling on the entire free market system when college students demand ethical investing. Kurtz seems pretty torn up about all of it, so much so that he tosses out this line, which manages to be as irrational as it is insulting. Fossil-fuel divestment is economics Lena Dunham–style: an embarrassingly naïve and apparently futile stance by those who nonetheless hold the power to swing elections and shift the culture. Really? Do we have to take a cheap shot at Lena Dunham in an anti-divestment article? Moreover, how exactly are the student activists in 350.org naive and futile at the same time that they swing elections and shift culture? Someone should reassure Kurtz that abolitionists crusaded against slavery and capitalism survived. In fact, capitalism became the force by which slavery was ended in the United States, despite the national economy relying on it. There is no reason why capitalism today cannot spearhead the attack on fossil fuels. The actions of a divestment movement are themselves the actions of liberal capitalists: investors choosing where to put there money, what stocks to own, and what goods they want to produce. The effect of divestment might be far greater in the realm of public relations and media than in economic pressure, but as the abolitionists demonstrated, that may be the best way to win votes. Voting Rights in "Wonder Land"